The other day, I stole a few moments to bop over to Sara’s lovely blog, Sprouted Kitchen, to take a peak at what she had cooking. When I arrived I was instantly arrested, not by the recipe but by the quote she began her post with. This captivated me. This simple, beautiful statement that captures so much of the personality of beets. They are enticing and they are challenging, colorwise, flavorwise, every which way. Of course Nigel Slater would point this out so gracefully. A brilliant cook and writer, he has a gentle, loving way with vegetables that makes the title of his cookbook Tender more than appropriate. It is not just the texture of a cooked vegetable between your teeth, it seems it is simple, perfect truth about his relationship to these vegetables. I have read quite a few reviews of Tender and seen several recipes from it, all of which beckoned me, hinted that this paean to vegetables, carefully grown and prepared, may be something that I could put in my “need” category without any acrobatics of conscience. But, it was these beguiling sentences that made me feel I had to have it. I read them and ordered the book immediately. Apparently this is how I make decisions. Alas, it has not arrived quite yet, so I’ve had to turn elsewhere for inspiration for the beets in my refrigerator. I asked Joel to buy some beets the other day without having any real purpose for them in mind. It just felt that beets were in the air. I had been seeing recipes for them everywhere. They’re not quite in season, but perhaps it is the nearness of both Passover and Easter that has us wanting to cook with a vegetable that stains our hands and dishcloths an inky venous red. Reminiscent of wine, or blood. Maybe that’s just reading into things. Maybe I am seeing beets everywhere simply because I have beets on my own mind. Believing is seeing, after all. Playing cookbook roulette with Sunday Suppers at Lucques – a cookbook where you truly can’t go wrong by simply flipping it open and pointing – the recipe my index finger happened to land on was for nothing else but beets. Beets roasted and then bedecked with a droopy white cap of horseradish cream. Have we talked about horseradish cream enough yet? Absolutely not! I have merely mentioned it, and it deserves so much more than a mere mention. I think this sauce, made of horseradish stirred into creme fraiche, is like the condiment equivalent of avocado or bacon. It makes almost anything tastier. The five year old in my head just retorted, “oh yeah, will it make ice cream tastier?” No. No it will not. I guess it isn’t quite as versatile as avocado or bacon, but it is more versatile than you might imagine. And simply delectable. 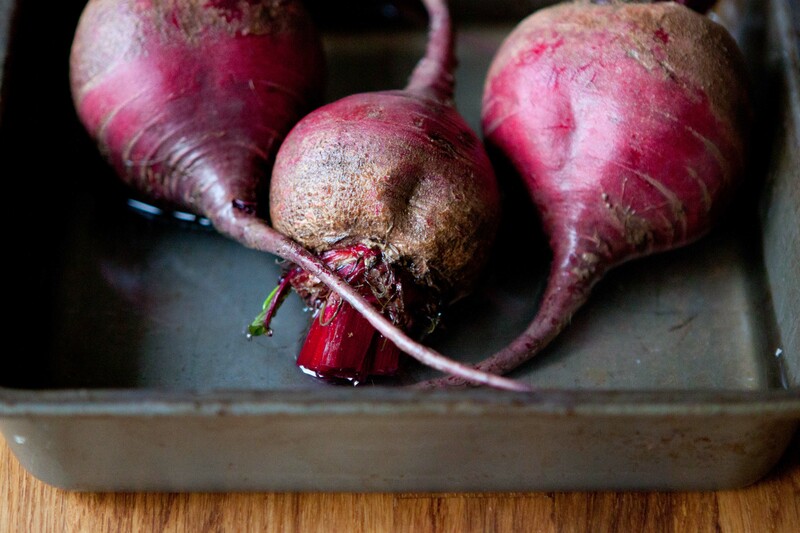 It may also be roasted beets’ unexpected, pugnacious best friend. 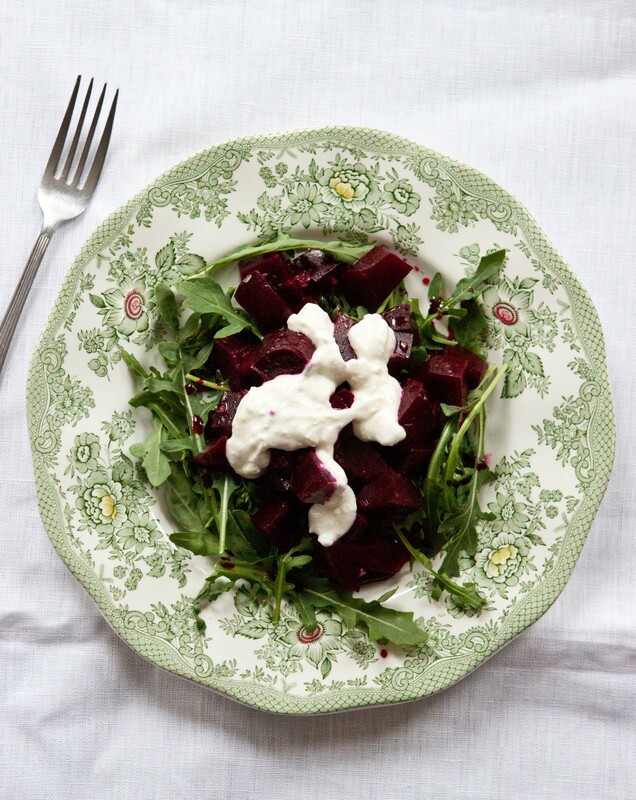 As Slater points out, beets do indeed take to creamy white pairings – soft cheeses, creamy dressings – like a hipster takes to irony. It practically makes them what they are. But horseradish, well horseradish adds another dimension, an excellent one, I might venture. Like having the verbal nimbleness to throw in a brain tickling quip or pun along with your skads of irony. You see, roasted beets are sweet; earthy and very, very sweet. Downright syrupy. Creamy things, especially those with an edge of tang like crème fraiche or yogurt, soothe and contain that sweetness. But, then horseradish rides in brandishing flavors of wood! and stem! a little sulpherousness! and salinity! In other words, just what you want to seriously liven a party up. The beets are also dressed in a lively, tangy dressing with a mix of vinegars and lemon juice, which doesn’t hurt one bit. I served my beets on a bed of arugula to make a full salad of it, and with the small amount of leftovers I discovered the addictiveness of beet plus horseradish cream plus avocado. I highly recommend it. Beets are in the air, after all. If the leaves are still attached to the beets, cut them off leaving a bit of stem on top of the beets. 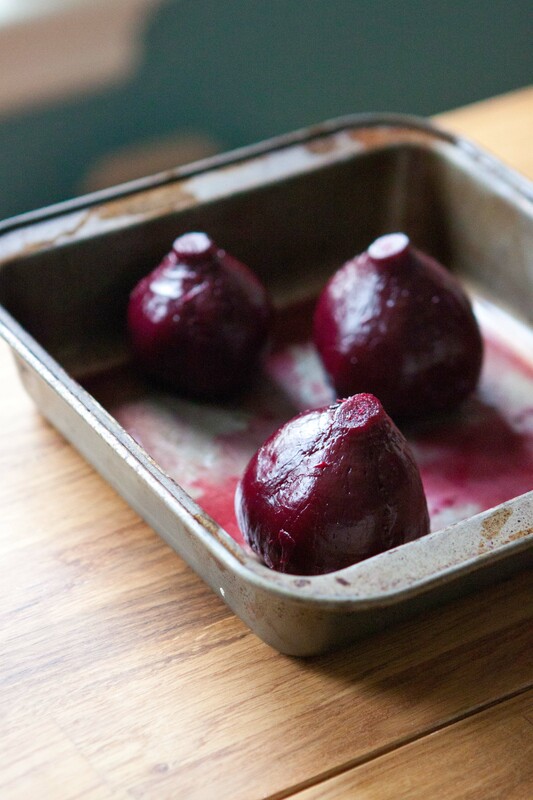 Put the whole beets in a baking pan with a bit of water in the bottom and cover them tightly with tinfoil. 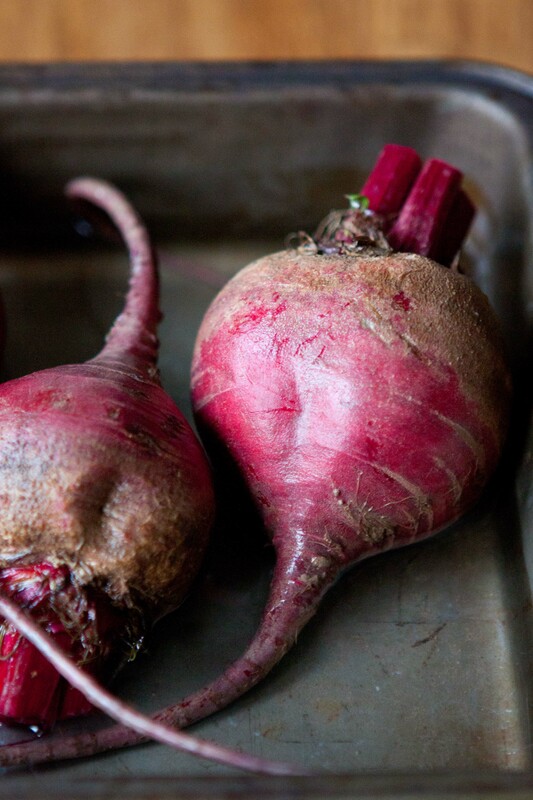 Roast them in a 425F oven until the beets are very easily pierced by a knife, around 50 minutes. Allow the beets to cool, and once cool, cut off the tips and tops and use your fingers to rub the skins off. Then, cut the beets into cubes. Put the shallots in a small bowl with the vinegars and ½ Tbs. lemon juice and set aside for 15 min. After 15 minutes, whisk in 2 Tbs. olive oil, then toss this with the beets. Sprinkle with salt and pepper. In another small bowl, stir together the crème fraiche, horseradish, and 1 tsp. lemon juice. Season to taste with salt and pepper. Finally, toss the arugula with the remaining 1 tsp. each of olive oil and lemon juice. 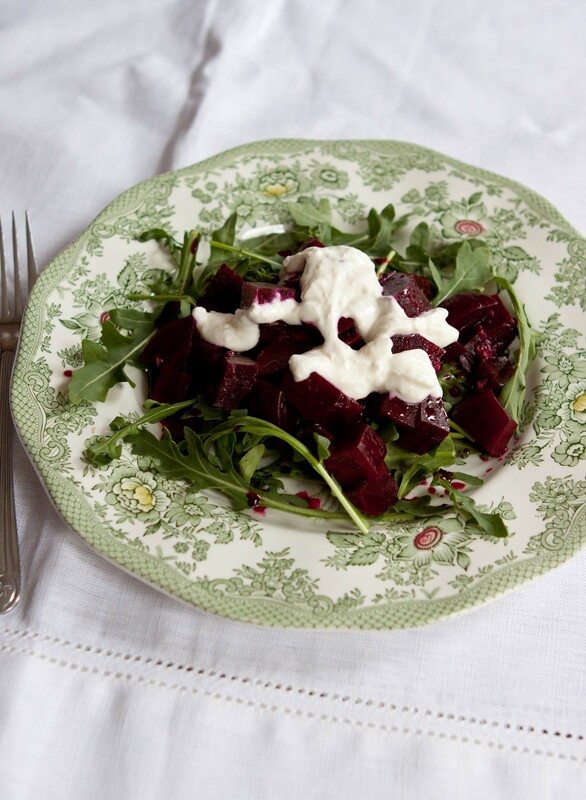 Put the arugula on a serving platter, carefully spoon the beets over, finally spoon the horseradish cream over the beets. Serve! She was so personable, so witty and utterly charming. It was just a joy to watch and listen to her. I’m making a beet dish right now! Next time I get some I’ll try out this recipe too. By the way, Tender Volume II (known in the US as Ripe) will be out in April here in the US and is all about fruit. Beautiful salad! I love beets and goat cheese, and they’re so photogenic! Love these pics. We’ve just done some beetroot stuff, and m&m is right – so photogenic! This sounds and looks amazing!! I ate so many beets growing up, but it took me awhile to discover arugula. I love the idea of them together with horseradish cream. Yum yum! Thank you! You should give it a try! They’re a great pairing. 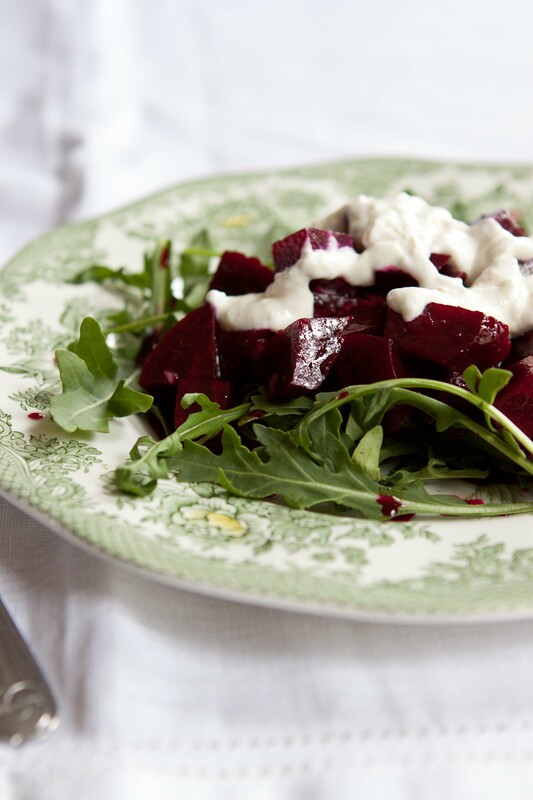 You are currently reading Roasted beets and arugula with horseradish cream at Five And Spice.